As many of you know, I’ve been silly excited for what amounts to my second “proper” vacation since I graduated college (it’s been a few years, folks!). After a ridiculous itinerary full of flights on United Airlines (oh, how I miss the days when Continental existed! ), including 20 hours of flight time with no wi-fi and no power outlets (rendering my laptop useless inside of 3 1/2 hours), I arrived into Singapore at ~1:30AM local time yesterday (the marker indicates where I’m staying in Singapore). I’m here for two weeks, visiting with a friend who has been living here for ~2 1/2 years. We don’t have many firm plans (at least that I’m aware of), but we do plan to golf and eat and drink our way through Singapore, Indonesia, Malaysia, and perhaps Thailand. Since yesterday was my first day here, Steve (aforementioned friend) wanted to keep things low-key, anticipating that my jet lag would hit on a moment’s notice. Our plan was to hit most of the “touristy” stuff and to make sure I could snap photos of the “must see” sights of Singapore. 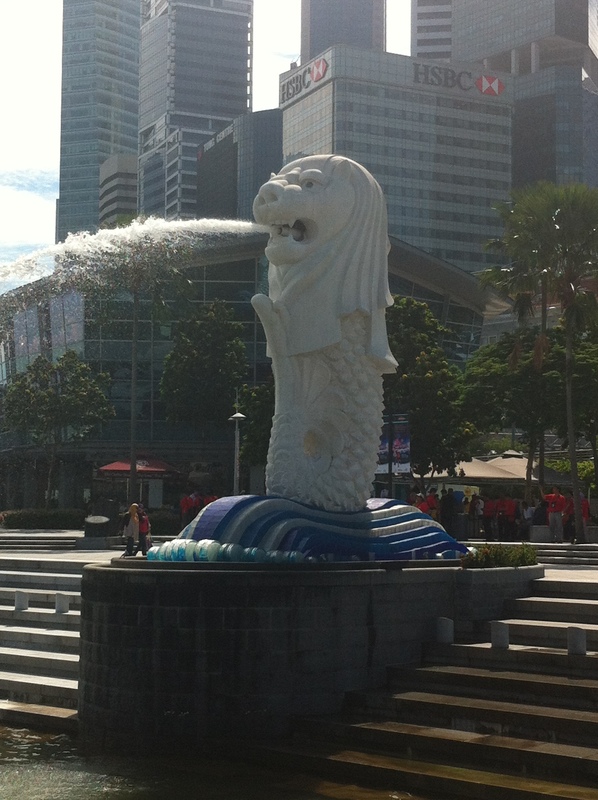 We set out on foot from Robertson Quay (pronounced “key”) and walked through Clarke Quay and over to Boat Quay. Neither Steve nor I are finicky eaters, so the most difficult part of lunch was making a decision as to what to eat! There are endless seafood restaurants, British pub food, Thai and Indian cuisine, and more. And, as we walked we got to check out the lunch fare – tanks full of live fish, lobsters, and the most humongous crabs I’ve ever seen – lined the sidewalks. I’ll save a picture of those for when we have Chili Crab later this week. We decided to stop at Forum Seafood. Steve said they have the best seafood along the walk – and who am I to argue with the resident expert? I surrendered the ordering process over to Steve, and in response to my challenge, he ordered several plates for us to share, and I have to say he did a really nice job! 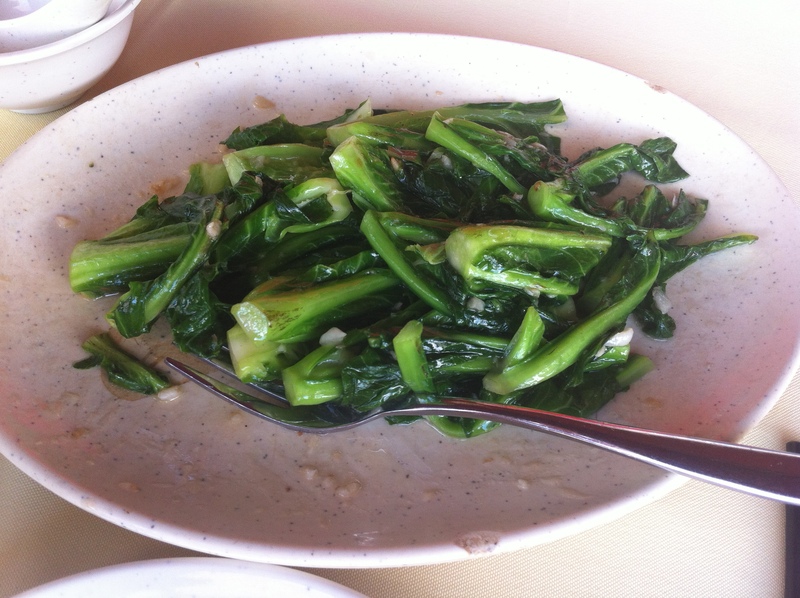 We’re both pretty skilled with our chop sticks, so we tossed aside the provided fork and dove right into the Baby Kailan (sautéed greens, with garlic and butter). I’m glad that Steve likes veggies as much as I do! A good choice. Then, it was on to the Mango Salad. It was refreshing and delicious! Full of flavors, including peanuts, cucumbers, onions, red chiles, etc. 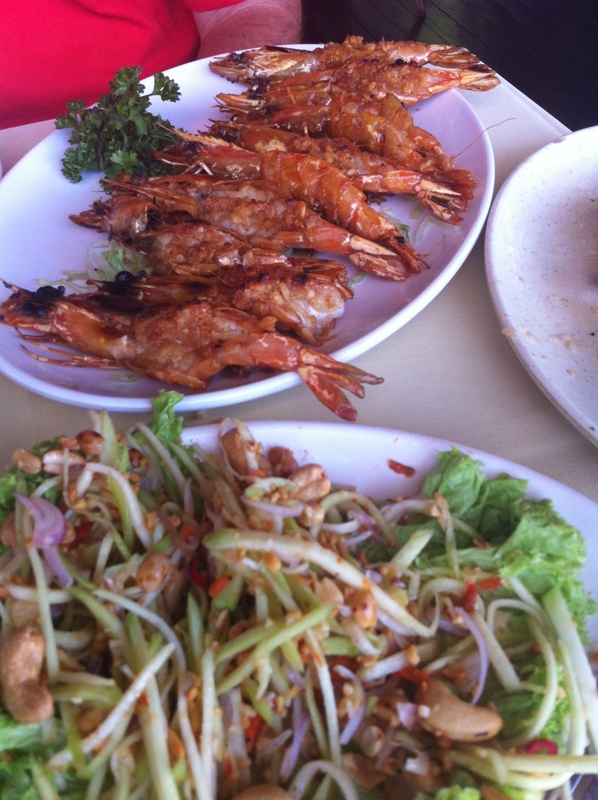 As you can see, we also dug into some Tiger Prawns, prepared BBQ and garlic style. Both Steve and I were laughing about the fact that we’d later be sweating out garlic as we walked in the 88F/31C weather. There was no shortage of garlic in our meal! Finally, he had ordered the Bamboo clams steamed in butter and, you guessed, it…garlic! However, our server came back to tell us that they had sold out of the Bamboo clams and she brought over a Venus clam to show Steve. He ordered one for each of us, and when they arrived…Dear Lord, those clams were huge! 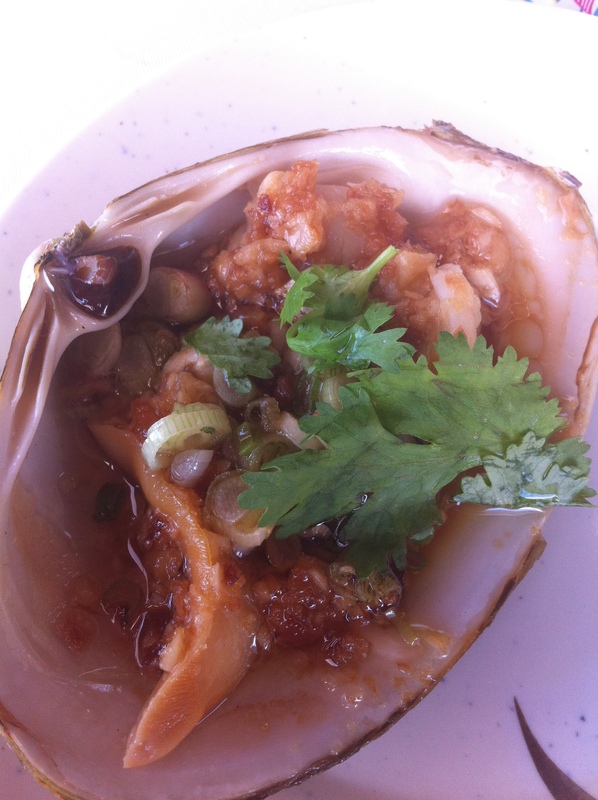 The staff had attempted to cut the clams into pieces to help us eat them, but failed to fully slice mine. I was left with this huge piece of meat and Steve was cracking up watching me try to manipulate that thing into my mouth. It’s definitely not something a girl would want to order on a date! That said, although the first bite was a bit tough, the second and third bites were pretty tasty. I admit that I didn’t help Steve eat enough…I left him with several prawns to finish. It wasn’t that they weren’t tasty, it’s just that I was comfortably full, and I’m glad I didn’t overdo it. We ended up walking, and walking and walking around the city/state. I’ve included a handful of pictures at the end of this post. After seeing so much, and enjoying a truly gorgeous day, we went back to Steve’s apartment and chilled for an hour and a half or so. We may have each snuck a little cat nap in there too! At ~8:30PM, we headed downstairs and scouted out Robertson Walk. Ultimately, we decided to eat at Wine Connection, at a table on the street. Luckily, Steve and I have very similar taste in wine, along with open-mindedness about food. 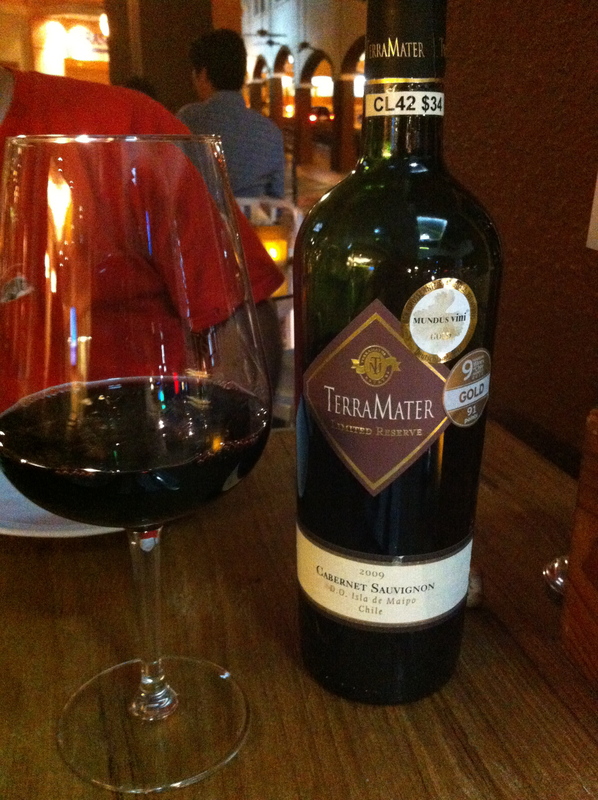 He ordered a bottle of the “2009 Terra Mater Limited Reserve Cabernet Sauvignon” to pair with our “choose 5 cheese and charcuterie” board. For the meal, we chose Pecorino Siciliano (Italian), Brie de Meaux (French), Gorgonzola Mascarpone (Italy), and Munster “Val de Weiss” (France) (because the restaurant was out of goat cheese). 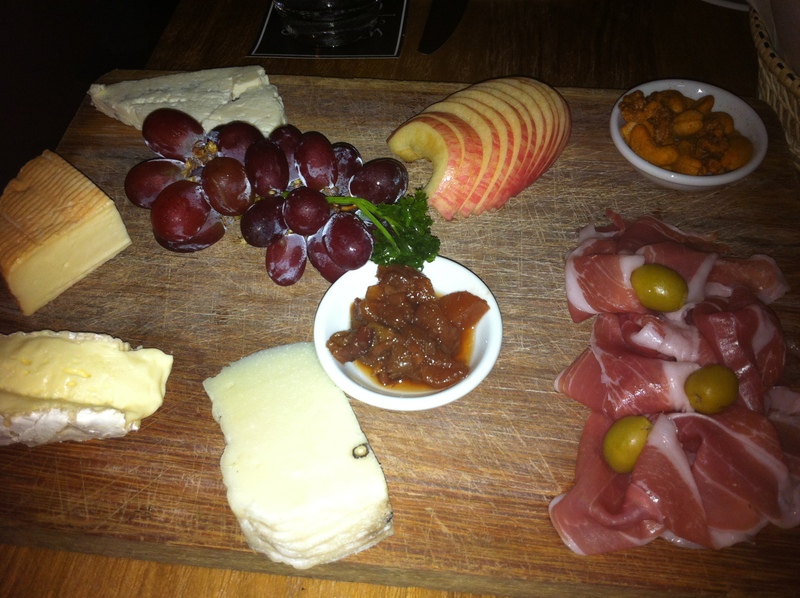 Steve also chose Prosciutto de Parma to round out the plate. Hands down, our favorites were that happy little accident that was the Munster – a creamy, brie-like texture wrapped in the traditional firm casing, and the Gorgonzola – also somewhat creamy, but with a subtle flavor that kicks in over time. The Pecorino was fine, but nothing too fancy. When we caught a taste of the peppercorns, we both found the cheese to be much more interesting. The Brie…now, that was another story. Both Steve and I are big fans of Brie, but this one not only had quite a stench, but a taste to match it. It was unlike any Brie either of us had ever had – and not in a good way! We struggled to finish that portion. We did not struggle to finish the wine, and had we had more energy, I’m confident we would have ordered another bottle. I think we’ll be back before I leave to enjoy another round at Wine Connection. 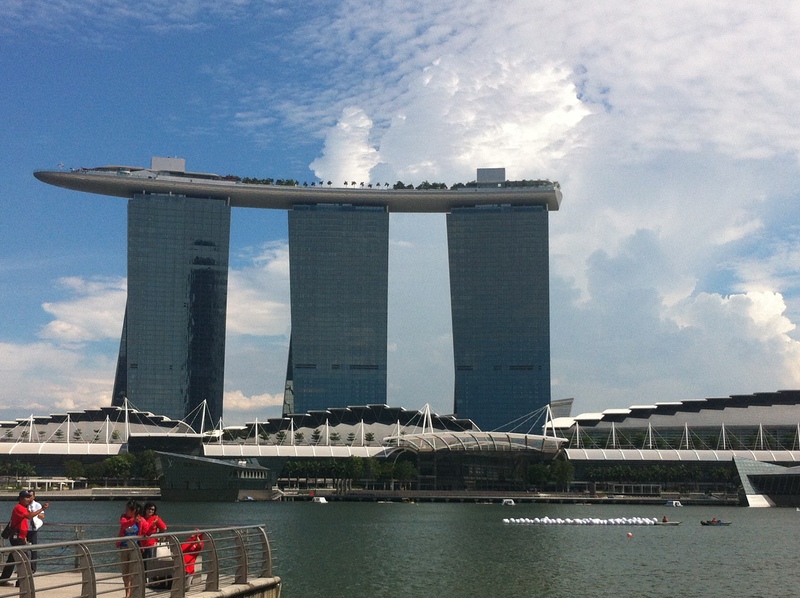 I’ll leave you with a few pictures of the sites we saw during the day, including the famous “Merlion Statue“, the Marina Bay Sands, the Botanical Gardens, and a couple of other interesting spots. The Ferris Wheel (“a ‘couples’ thing” according to Steve, since dinner is served on board!) 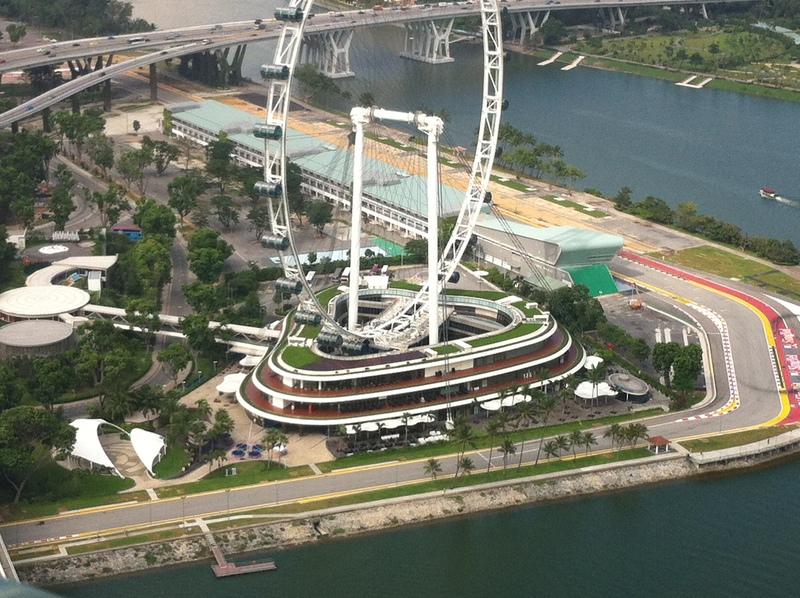 and part of the Formula 1 race track that goes through the city. 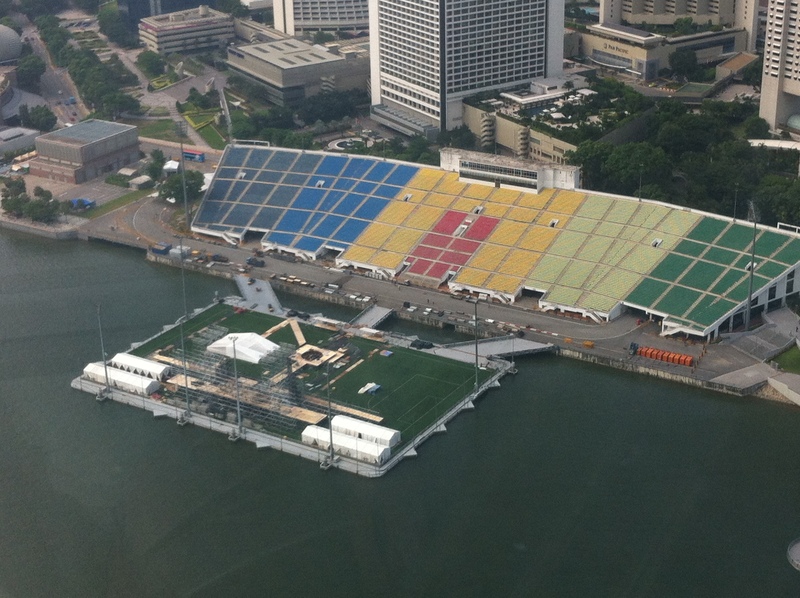 Doesn’t every city have a floating soccer field? 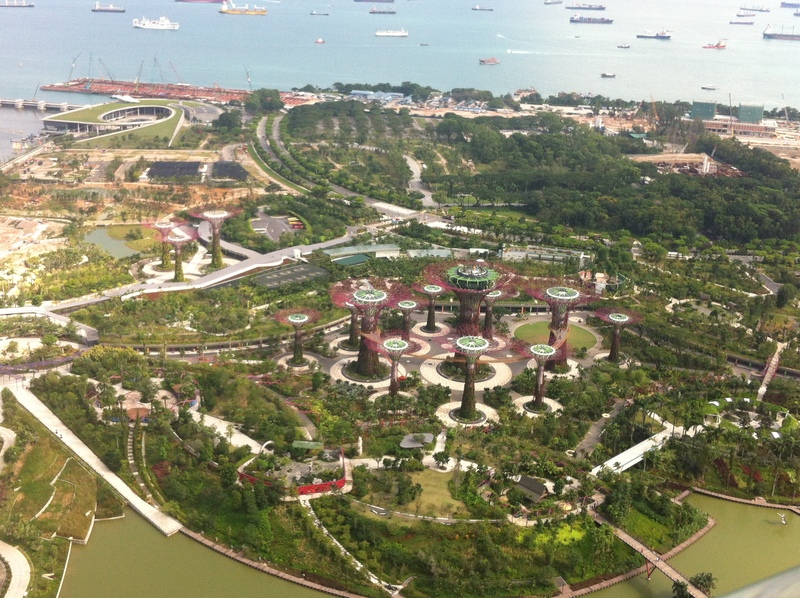 Stay tuned for more adventures in Singapore and the surrounding areas! If you have advice on must-try spots, please leave a comment! Your coolest post yet, lil lady. Can’t wait to post golf pics for you!